Casa Alegria (House of Happiness) is a wonderful light and spacious 2 bedroom, 2.5 bath ground floor rental condo located in Villas Del Mar, Puerto Aventuras. As you enter your vacation home your eyes are drawn to the breathtaking ocean and pool views that beckon from just a short distance away. The comfortable living area makes vacationing and relaxing so easy! The living room has comfortable sofa, Satellite TV, DVD. The fully equipped kitchen with all modern conveniences will please the most discerning chef. There is a breakfast bar with bar stools and also a dining table for enjoying the local culinary delights! There is a wet bar in the living area, perfect for whizzing up the cocktail of choice for an afternoon of enjoying the Caribbean Atmosphere. From the living area, you step right out to the huge terrace with hot tub. An afternoon relaxing watching the views and your favorite book is the perfect way to spend a vacation! The outdoor dining table enables you to enjoy the outdoor atmosphere mealtime, snack time and anytime! Play a round of golf in the Puerto Aventuras 9 hole golf course, go deep sea fishing, catamaran tour, snorkel, play tennis, these and more activities can be performed or booked right here in Puerto Aventuras. The Riviera Maya offers fantastic eco-parks such as Xcaret, Xel-ha, Aktun-chen, explore the ancient Mayan ruins, Playa del Carmen is a 15 minute drive, many surprising and exciting adventures await for you. 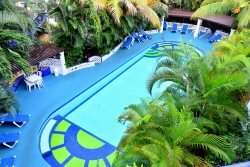 For a comfortable and relaxing Caribbean Vacation choose Casa Alegria ! Bedrooms: TVs are provided in each of the bedrooms. •iPod docking station in the master bedroom – please bring your own iPod! Please plan to arrive at your vacation home no earlier than 3pm. Please do not enter the premises before this time. For arrival on or after the above times, go directly to your vacation home. The key will be inside a lock box by the front door. Vacation home entry instructions will be sent a week prior to arrival.